Ebisu, located in Shibuya ward, is a sweet little area of Tokyo that is known for its cozy and small restaurants, pubs and famous standing bars (tachinomiya). For the last few years, Tokyo locals have consistently ranked Ebisu as the neighborhood they would most want to live in. It’s quite different from other parts of the city in that it is really laid back, making it a refreshing break from the chaos of the big city and a great area to kick back to enjoy some good food and a drink. Meet your guide at 5:30 PM at Ebisu Station and begin your 2.5 hour food tour by getting acquainted with your tour guide and others in your small group. Spend the next 2.5 hours roaming this hidden food scene of Tokyo, visiting multiple restaurants and stalls and trying a variety of Japanese food including okonomiyaki, takoyaki and yakitori. 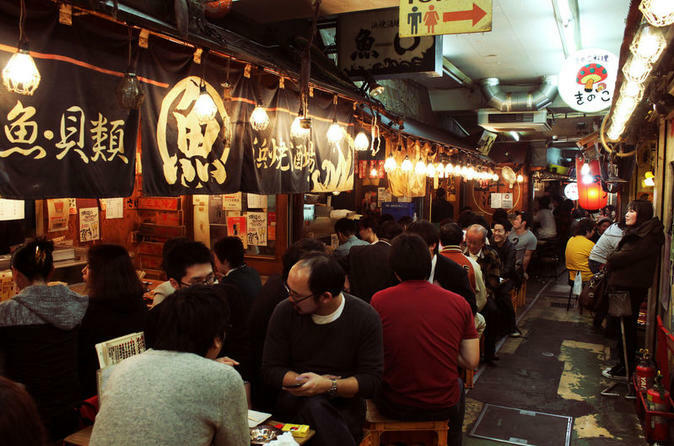 Walk around a lively alley with dozens of small shops and bars in the heart of Ebisu, where you will experience how locals spend their evenings after work by enjoying their favorite foods with a beer or sake. After the feast, sip on a beer, sake or just juice/ soda (one drink included) to wash down all the food before having some Japanese dessert to end the Ebisu food tour.